The cast of Cemetery Stories at the Anchorage Cemetery, August 2017. 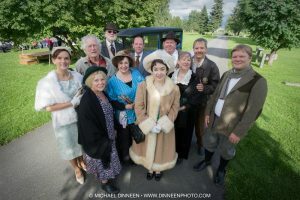 Linda Benson and Bruce Kelly of Stories at the Cemetery drop by Stage Talk this week to chat about all the fascinating characters that are brought to life in the Anchorage Memorial Park Cemetery. This annual event, in which the general public walks from grave site to grave site to hear live actors reenact the lives of former Anchorage residents, will happen this July 8th from 6:00pm to 8:00pm. And on August 12th, the event repeats with all the actors performing on a single stage. ORIGINAL BROADCAST: Friday, June 29 at 2:45 p.m.